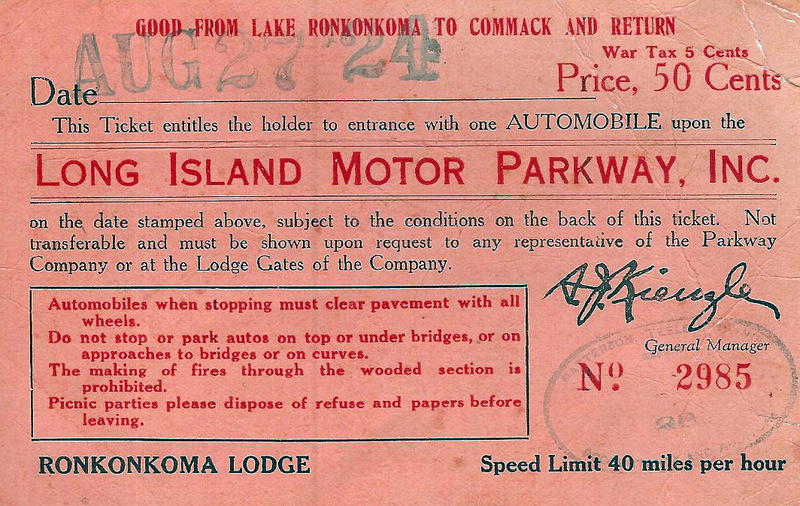 A very neat Motor Parkway collectible is the "ticket" that was given to the driver when they passed through a toll lodge. 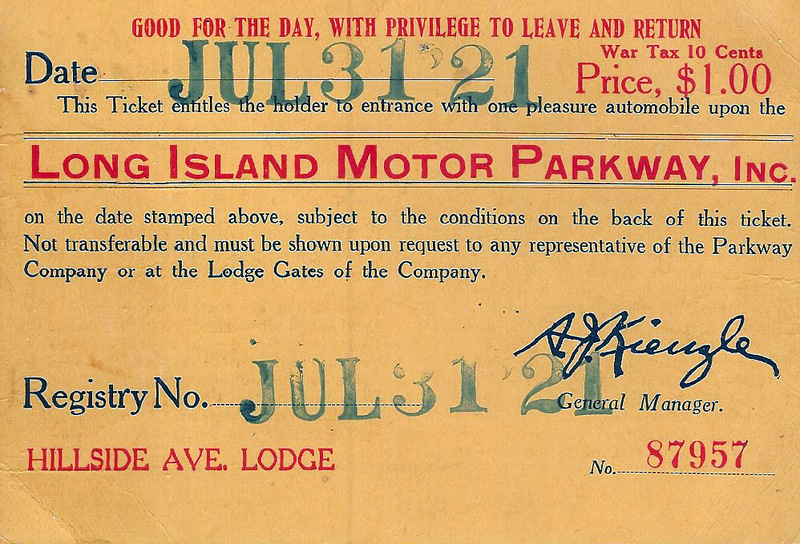 The ticket had the stamped date, the price of the ticket and the toll lodge in which the automobile entered the Motor Parkway. Here is my collection of six Motor Parkway tickets. 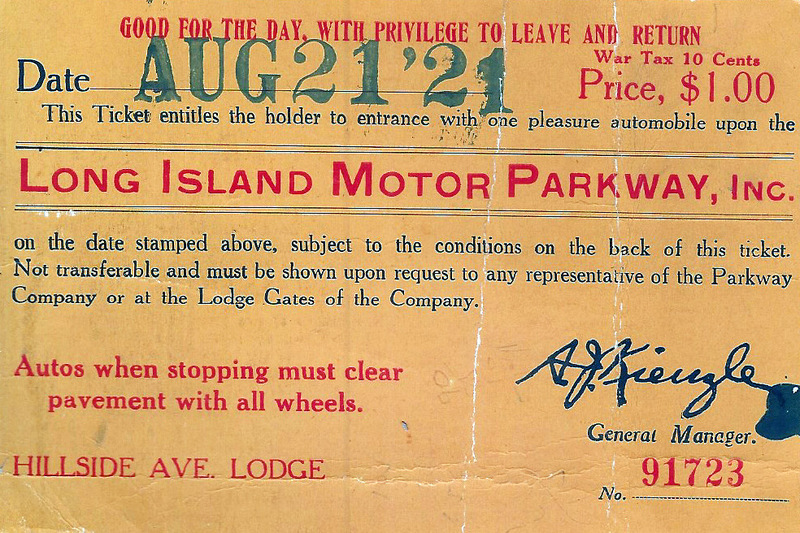 A driver receiving a toll ticket at the Bethpage Lodge. 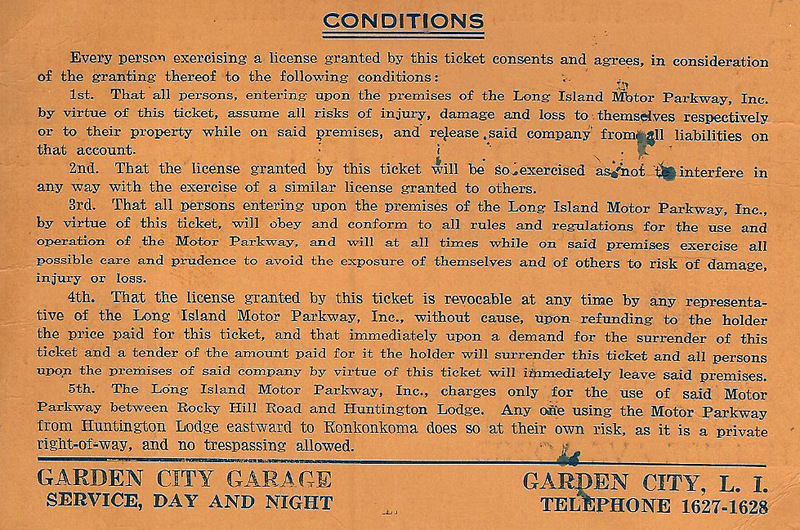 The reverse side of this ticket included an ad for the Garden City Garage. 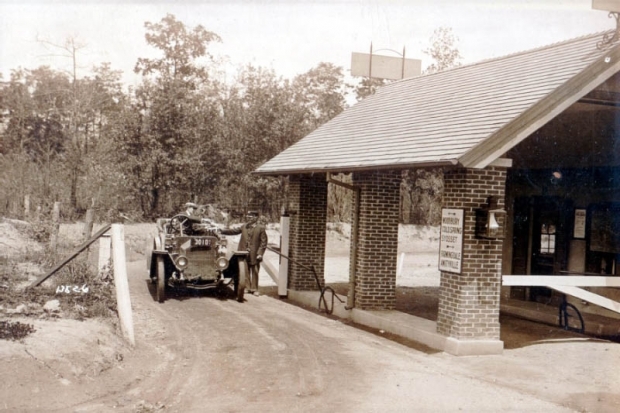 Howard, the kiosk at western terminus must’ve been manned, at least in 1930, as they were giving drivers admission tickets from the Nassau Blvd lodge. You may be right. However, automobiles could easily bypass the Nassau Boulevard entrance by going on the dirt road entrance at 73rd Avenue. After viewing these tickets, nothing was left to confusion. A tight ship was run here! The 5th condition on the last ticket SEEMS like it’s stating that there was “no charge”...fee? traveling between Huntington and Lake Ronkonkoma? 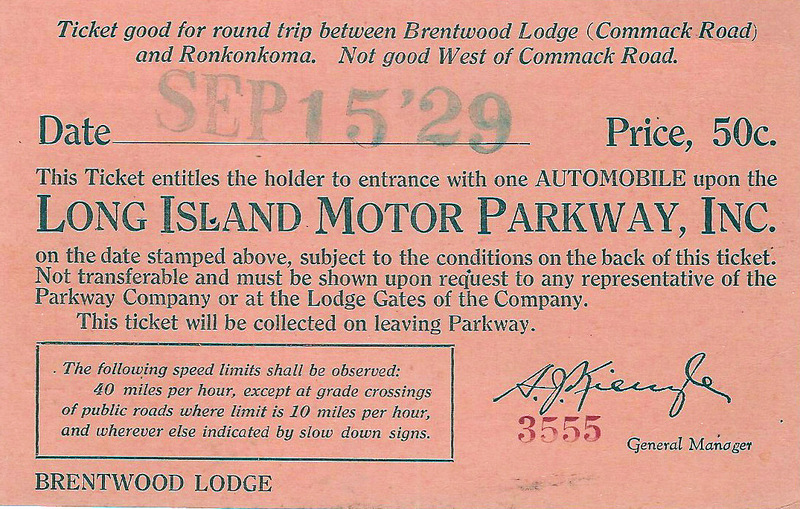 But the Brentwood ticket was .50 ct, as long as you didn’t travel west of Commack Rd. 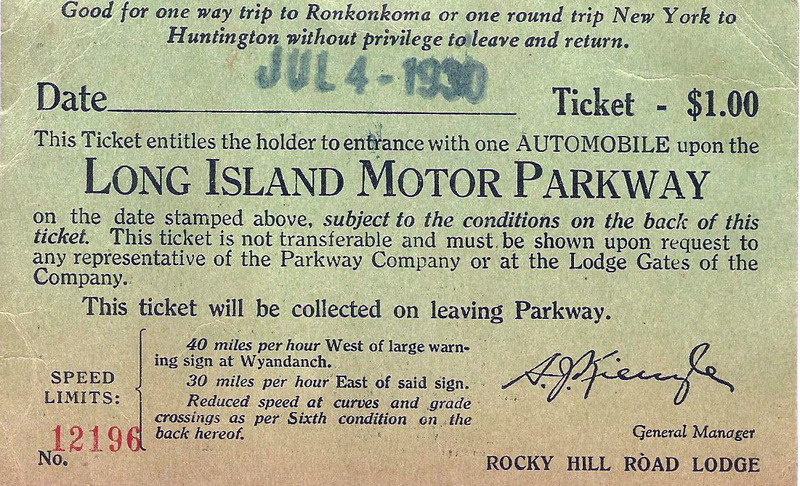 Bill, Motor Parkway toll tickets show up on EBay quite often. Since there are less than 100 know plates still existing, Motor Parkway license plates are usually purchased from collectors. Frank, The western terminus of the Parkway was never manned. Those motorists entering the Parkway at Nassau Blvd. paid the toll at the Rocky Hill Rd. entrance and received a ticket that said Nassau Blvd. Those entering at Rocky Hill Rd. received a ticket with that designation. 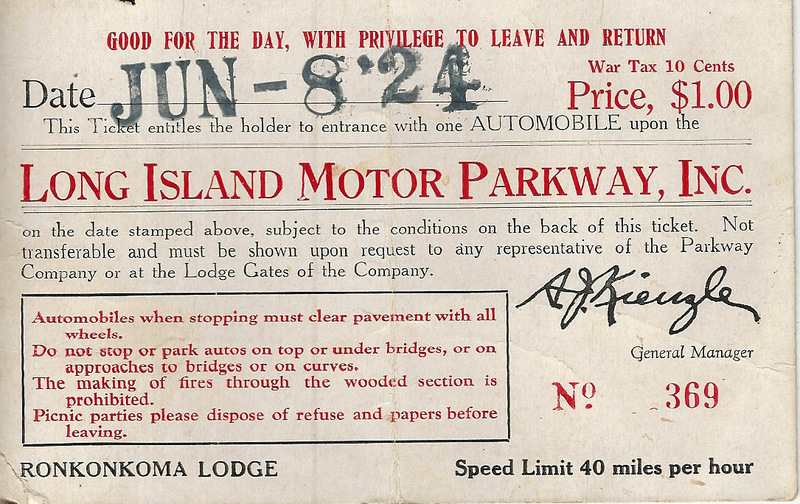 This is how the Parkway kept track of where automobiles accessed the Parkway. 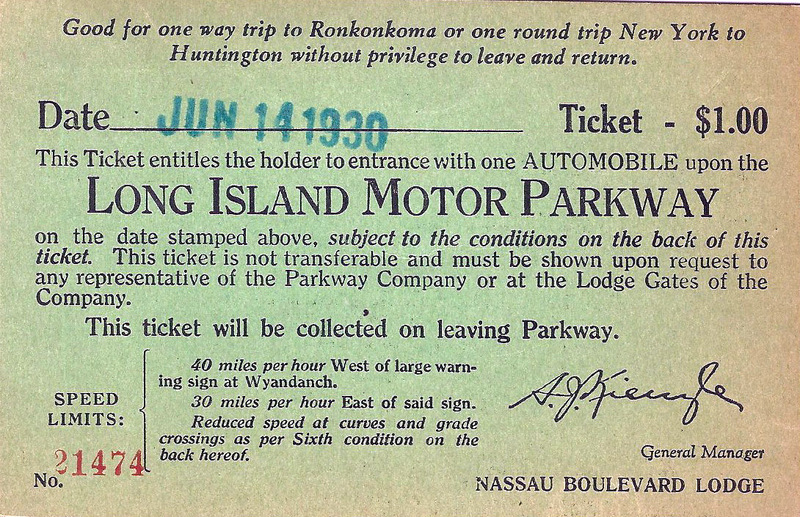 There really wasn’t a need for a toll collector at Nassau Blvd. If you entered the Parkway there you couldn’t get off until Rocky Hill Rd. and you had to pay a toll at that point or…. turn around and go back to Nassau Blvd. Howard, Regarding automobiles entering the Parkway at 73rd Ave. In 1926 when it was known as Black Stump Rd., it was the designed Parkway entrance as indicated in the flyer the Parkway issued that year. The western parkway extension was completed to that point while the section north of there was still being built. Bob, it was one price for getting on and getting off…no matter the distance. The different price reflect the year. Would this be worth something to a collector?